Echelon CAE Services Pvt. Ltd. is an engineering service company with specialist expertise in CAE (Computer Aided Engineering) services based in Mumbai, India. We endeavour to provide the best yet cost effective design and development services to domestic and foreign clients. 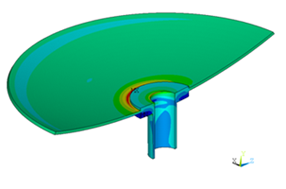 Echelon has mainly provided its support for General Engineering applications to carry out Finite element analysis for various clients globally. Echelon has extensive experience in doing the structural calculations for various steel structures used in the petroleum refineries, bridge structures etc. Echelon has done various simulations as on when required by the clients for pressure vessels, rotary equipments, heat exchangers etc. One of the major complex projects was in carrying out the composite analysis including tall equipments, connecting pipelines operating at high temperature and supported on the wide steel structures. Echelon has carried out modal analysis and frequency response analysis for the electric cabinets. Echelon has successfully carried out thermal analysis and coupled field analysis. Echelon has carried out gantry girder mounted on the structures for different load cases with respect to wind loads and without the effect of the wind load with static loading as per European regulations. Modal and Buckling Analysis: Nonlinear buckling analysis and Eigen-value extraction using FEA techniques. 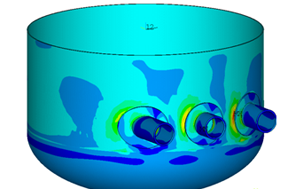 Structural Static Analysis: FEA for thin shell structures for vessels and heat exchangers. The loading may include the operational pressure and temperature or the combination of it. Or it may include the external pressures or wind loads, depending on the requirements. Steady State Thermal Analysis and Transient Analysis: Carried out FEA for solid structures using hexahedral elements for tube sheets, flanges etc. Response Spectrum Analysis: Carried out model and response spectrum analysis of structures, piping and equipments.